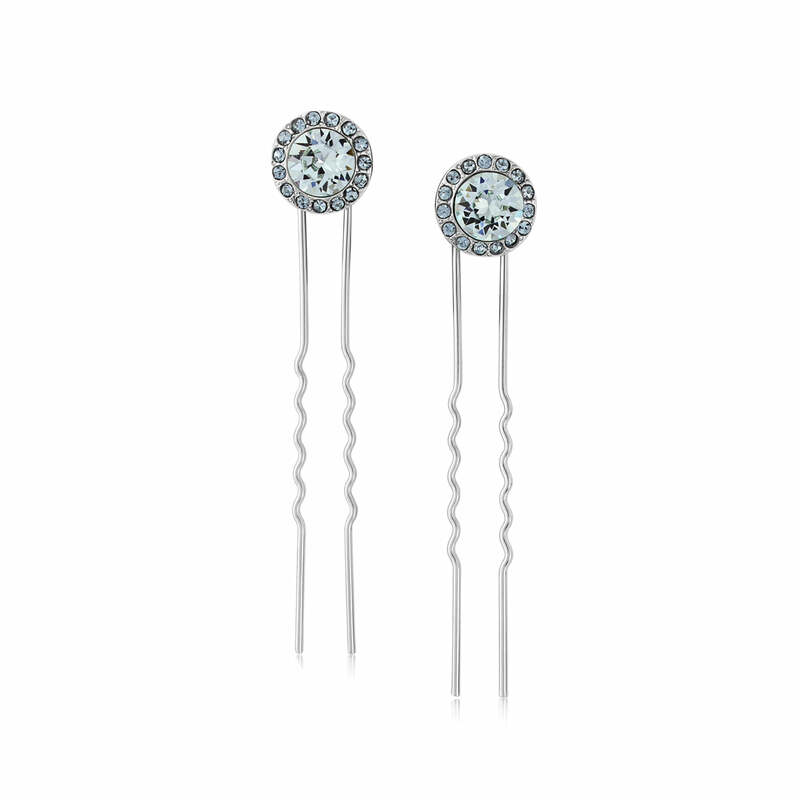 Pretty pastel blue hair pins which will add a subtle "something blue" for chic elegance. Awash with the most tranquil and enigmatic hue of blue, our Waterfall of Love Hair Pins conjure up thoughts of a clear tropical ocean. Featuring a pale azure blue crystal surrounded by a divine deeper hue, these chic silver tone hair pins adorn with the subtlest hint of colour. A style collision of retro and modern influences, this versatile pair bejewel a 50s backcombed beehive with vintage charm and a French pleat with timeless sophistication. Team with our coordinating jewellery collection in this serene shade for a cool, classy look for every occasion. The perfect palest blue bridal hair accessories for brides looking for a subtle ‘something blue’ to adhere to the infamous wedding tradition, our Waterfall of Love Hair Pins are the essence of elegance. Beautiful accessories for bridesmaids to accentuate your theme, these pretty pins will bring the ultimate measure of vintage and contemporary style.